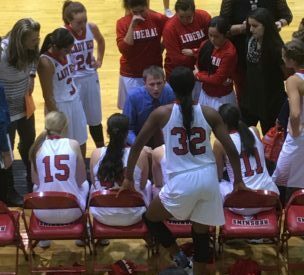 The Liberal Lady Redskins are 3-0 after a 52-41 win over Hereford in the Big House as part of the Conestoga/Community Bank Classic Thursday night. Jada Mickens scored 18 and Machia Mullens added 14 on the way to the win. The Lady Whitefaces beat LHS by 30 last year. The Lady Skins led 8-7 after 1, 19-14 at halftime, and 36-23 after three. Hereford is 5-6 and plays Dodge City Friday at noon in the Big House as part of the Conestoga/Community Bank Classic. Liberal plays Wichita Collegiate Saturday at 2:30 in Cheney on 1270 and kscbnews.net. The game is a make up for the fact that Liberal was unable to field another team for the Conestoga/Community Bank Classic.